We arrived at midnight. Still, Hawaii's balmy, flower-scented air greeted our senses as we descended from the plane direct from Oregon. It was July, 1960, and we were 20-year-old "career girls" hoping for at least a year's office work in paradise, a dream come true. We came equipped with letters of introduction, job leads, and advice from Portlanders: "Whatever you do, beware of the beach boys!" For fun, we had even written down our secret individual predictions of adventures in Hawaii, to be opened and shared on a July date exactly one year away. Immediately upon collecting our luggage, we were welcomed by a friendly taxi driver, Albert, who gave us a free tour of Diamond Head Road complete with views of the "submarine races" and a late show at the Barefoot Bar before dropping us off at our hotel. Albert was the epitome of the hospitable Hawaiian greeter. He was such a dear that he actually picked us up the next morning and took us on a free tour around Oahu. Albert, wherever you are, thanks again! Not only did your aloha bless us, but it changed the course of my life. Talk about enchantment! Never had we gazed upon such blue water, black rocks and tropical foliage, or breathed in such perfumed air. Driving up Kalakaua Avenue was sheer class. The pedestrians were joyful and relaxed and loved to marvel at the fresh flower leis on display by the Hawaiian ladies selling them from their lei stands. Albert drove us through some neighborhoods around Diamond Head, introducing us to housewives puttering around their yards and offering us our first tastes of mango and papaya. After stopping at the gorgeous ocean lookouts, we continued on to the country, where we were fascinated by the sheer cliffs of the Koolau Range and the quaint country life of the Windward side. Even then, shells, coral, beach towels and seed jewelry were popular souvenirs being offered at the roadside stands. After lunch, we stopped on the highway overlooking Waimea Bay. Then off-limits to the military and devoid of restrooms and showers, the bay was still one of the most gorgeous beaches we had seen, and I begged Albert to take us down to the water. The poor fellow catered to our every whim, and eventually he was even badgered into introducing us to the group of young local people on the beach that hailed from his hometown of Wahiawa. These introductions proved to be his downfall, because our foursome gradually blended into the local party on the beach, and Albert was no longer the center of our attentions. As the beautiful afternoon progressed, my sense of adventure took over and I climbed to the top of the big rock at the edge of the bay. Local youth were showing off for the tourists watching from the highway by diving off the rock into the blue water below. They even swam completely through a natural tunnel under the rock. They were all having so much fun that I gladly joined their circle on top of the rock. They joked with me about their Pidgin English, whether they were the dreaded "beach boys" we were warned about, and their strange varieties of pupus. In this time of wonderment for me, I noticed a hapa-haole fellow who stood out frm the crowd not only in maturity but in looks. After we climbed down from the rock, this mystery man pushed me in the water, clothes and all! We swam to the outer rocks where we talked. Even though he was courageous enough to push me in the water, I was surprised to learn that he was really shy around Mainland girls. He was no macho beach boy, but the strong silent type. He said his name was Dondi, he was 24 year old and recently discharged from the air force. In his handsome eyes, I saw something wonderful. At dusk, Albert, we three tourists, and the group from Wahiawa all took a caravan ride back to our hotel in Waikiki where Dondi and I shared a goodnight kiss -- my first in Hawaii. Though brief, that kiss was a bombshell! Picture a moon rising, balmy breezes blowing, coconut fronds rustling. I was falling in love -- with both Dondi and Hawaii. We made plans to met the next day at the Waikiki Bowling Alley. My girlfriends warned me that he probably wouldn't show up, so I telephoned the alley and had him paged. To my disappointment, he did not answer the page. I tried in vane to forget him. The next week we busied ourselves moving into a Makiki apartment, applying for jobs in Honolulu and driving around in a pink jeep and enjoying our new tropical paradise. We sometimes strolled to Ala Moana Beach from our place, but more often our friend Albert took us on jaunts in his taxi. As happy as we were, I couldn't stop thinking about my new heartthrob. Somehow, Albert was able to get the word to the Wahiawa gang that I was pining for Dondi, because one night a week later, Dondi showed up at our new apartment. By that time, we had landed our jobs in town and made some new friends, but Dondi became my top priority from then on. We saw each other every evening. He taught me to eat sashimi, sticky rice, laulau, poke and poi. We frequented the Queen Surf's Barefoot Bar, Kapiolani Drive Inn, Waioli Tea Room, the Flamingo Restaurant, Waikiki Shell and the beaches. One time we even fell asleep behind the wheel of Dondi's small Thunderbird while going 10 miles an hour in Ala Moana Park and ran the car into a coconut tree! Lack of sleep was proving to be a problem for Dondi, as he was working various shifts at the Hawaiian Electric Power Plant. So, we solved that problem by getting married 3-1/2 months after meeting. (You can imagine us girls upon opening up and reading our secret predictions of life in Hawaii. Mine specifically stated that we were not going to waste our time on romance!) Dondi and I had a church wedding and a big luau at Dot's of Wahiawa. My parents came from Oregon, and of course, Albert was an honored guest. Not only was the luau new to me, but also being married to a guy who was raised 2,500 miles from my home. It was a leap-of-faith marriage, but God has blessed us with three children -- all married now -- and two grandchildren. Life has been sweet, and we have been fortunate enough to have visited my parents in Oregon often, as well as the other states. Dondi is retired from the HECO now and I have retired from various office jobs as well as child rearing. We are fast becoming elders in our believed Thomas Clan of Wahiawa, Ware clan of Portland and our multi-racial family at Makakilo Baptist Church. After 35 years of a very happy marriage, we count ourselves as privileged to be a part of "Hawaii Ways, Hawaii Days." 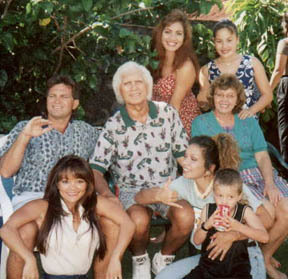 This is Judie and Dondi and their family, taken during 1997. Dondi died of cancer shortly after this was taken. We all miss him a great deal.